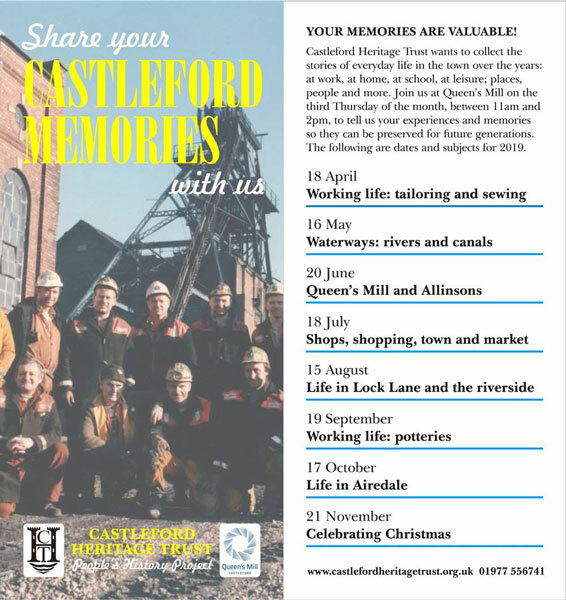 Building on the success of the weekly Wednesday social and activity mornings which started in January, the Archive Group are planning to launch a monthly Castleford Memories event. Starting in April, the idea is to get people sharing their memories of different aspects of life in the town each month, which will be recorded, archived and hopefully used as the basis for future presentations and projects, especially once the museum is up and running. The first topic, on Thursday 18th April, will be the town's tailoring industry, timed to coincide with an exhibition of the Quilting Group's work. Subsequent sessions will be: 16th May, rivers and canals; 20th June, Queen's Mill; 18th July, shops and shopping; 15th August, life in the Lock Lane area; 19th September, the pottery industry; 17th October, life in Airedale; 21st November, Christmas memories. The sessions will run from 11:00 to 14:00. If you would like to share your memories but cannot attend a meeting please contact us.